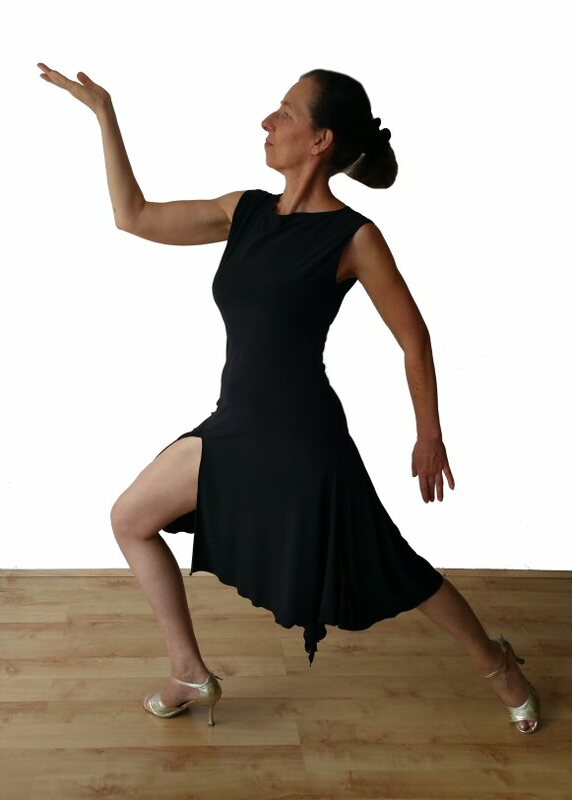 Dramatic, theatrical style Tango perforamance dress. One sleeve on the right arm with feather and rhinestone decorations. Slit on the right thigh. Zip at the back. The dress is stretchy and will adapt to your shape. Classic, Tango lines with a split at the back and another split on the right thigh. The dress is stretchy and will adapt to your shape easily. White ribbon attached over the leg split can be let loose, tied into a bow or cut off altogether. Length: front side 106cm (42"), at the back 123cm (48"). Our very popular simple and practical practice top goes well with almost anything. Made in stretch crepe it is very easy care: Machine washable, dries quickly and does not require ironing. 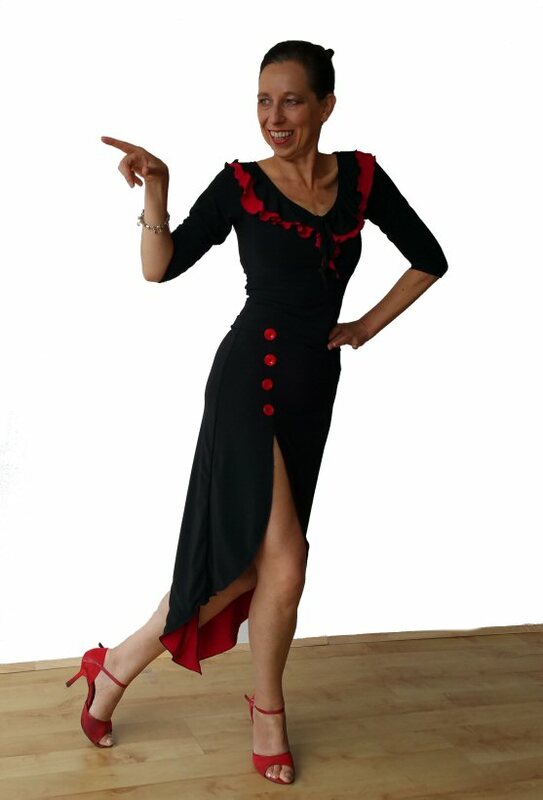 Classic Tango lines with split on the right thigh and half circle, peacock style insert at the back. Made in stretch crepe, the skirt will adapt to your shape easily. Elasticated waist. The fabric is easy care: machine washable, dries quickly and does not require ironing. Length on the front cm ("), to the longest place on the back, cm ("). This skirt can be made with a different colour edging. Photo shows: Black skirt, White edging. The ribbon attached over the leg split can be let loose, tied into a bow or cut off altogether. Length: front side 100cm (40"), at the back 122cm (48"). 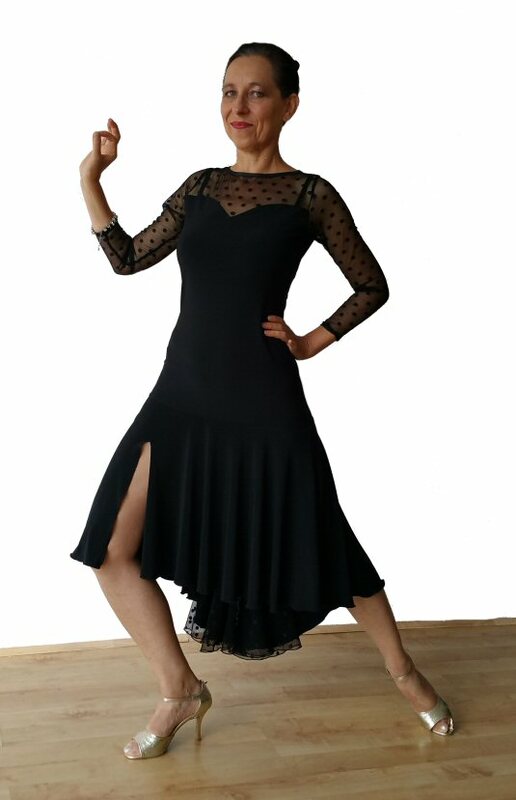 This is the same model as DR155, however the skirt is made with Black and Black lace irregular sections, which give the dress very Argentine Tango spirit. The dress is stretchy and will adapt to your shape easily. Classic, Tango lines with a split on the right thigh and longer section at the back. Black ribbon attached over the leg split can be let loose, tied into a bow or cut off altogether. Length: front side 100cm (40"), at the back 122cm (48"). Classic, Tango lines with a split at the back and another split on the right thigh. The dress is stretchy and will adapt to your shape easily. White ribbon attached over the leg split can be let loose, tied into a bow or cut off altogether. Length front side 106cm (42"), at the back 123cm (48"). 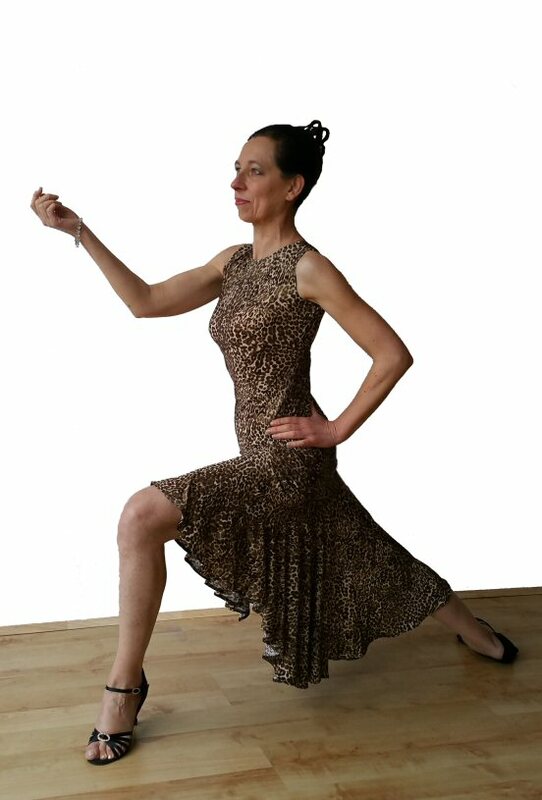 Classic Tango lines with split at the back and another split on the right thigh. Made in stretch crepe, the dress will adapt to your shape easily. The fabric is easy care: machine washable, dries quickly and does not require ironing. Stretch crepe skirt with vertical frill and a slit on the right thigh. Length from shoulder to hem: Right side 126cm (50"), Left side 97cm (38"). From waist to top of the slit 31cm (12"). This dress has the same design as Two colour vertical frill dress shown above, however the 2nd colour of the frill is the same as the main colour of the dress. Stretch crepe skirt with vertical frill and a slit on the right thigh. Length from shoulder to hem: Right side 126cm (50"), Left side 97cm (38"). From waist to top of the slit 31cm (12"). This is the same design as E-DR136 above with added 3/4 sleeves. Classic, sharp Tango lines with Rouched back, split at the back and another split on the right thigh. The dress is stretchy and will adapt to your shape easily, but sizing is on a small side, so we recommend ordering 1 size larger than you normally would. 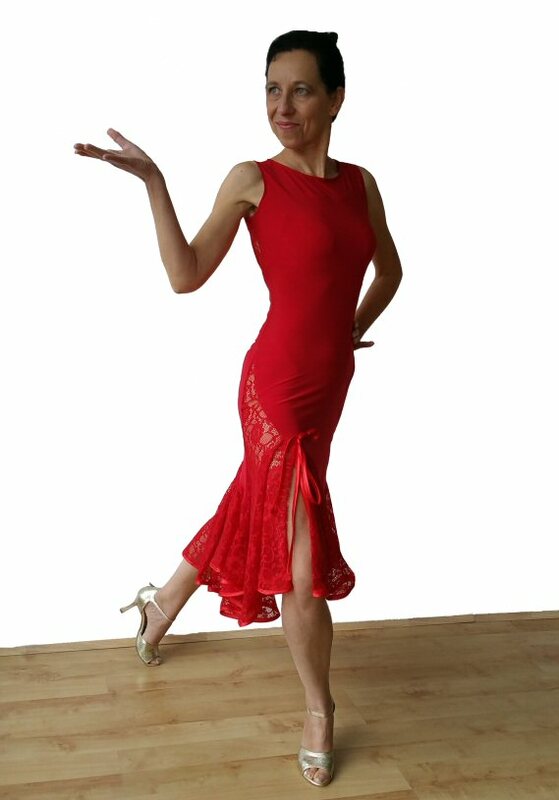 Classic, sharp Tango lines with Rouched back, split at the back and another split on the right thigh. The dress is stretchy and will adapt to your shape easily. Black only. This is the same design as DR146 above, however with 3/4 sleeves added. 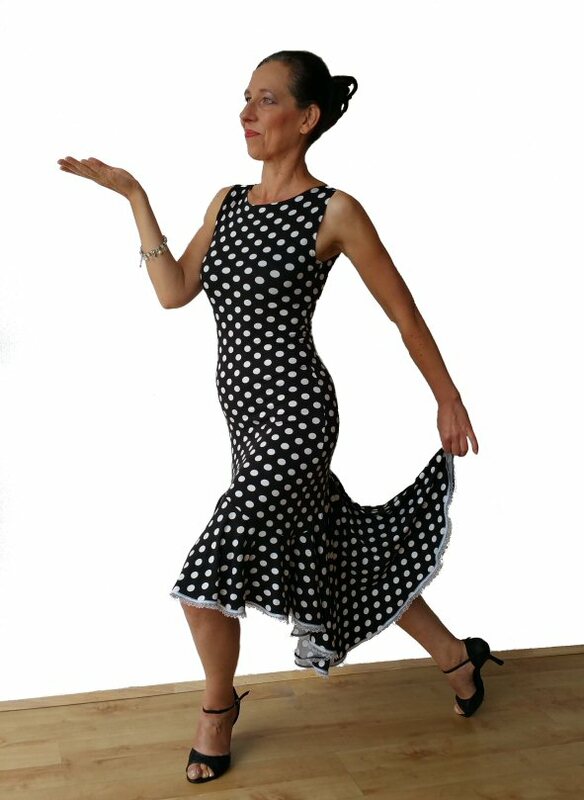 Classic Tango lines with split at the back and another split on the right thigh. Made in stretch crepe, the dress will adapt to your shape easily. The fabric is easy care: machine washable, dries quickly and does not require ironing. Single frill, wrap over look dress, which actually is not "wrap over". It is sewn all around. Slit on the left leg side. Long sleeves. (The flower broch shown with the red dress photo not included). "Wrap over" look top, which is securely sewn all around. Long sleeves. Single frill, wrap over look skirt, which actually is not "wrap over". It is sewn all around. Slit over the left leg. Stretch crepe top matching the vertical frill skirt.The second colour is used only inside the oval shaped sleeve endings. Stretch crepe skirt with vertical frill and a slit on the right thigh. Length: right side 78cm (31"), left side 62cm (24"). From waist to top of the slit 31cm (12"). Elasticated waist. The top to match E-S136 skirt. "Wrap over" style, but the top is sewn together, there is no need to tie it. 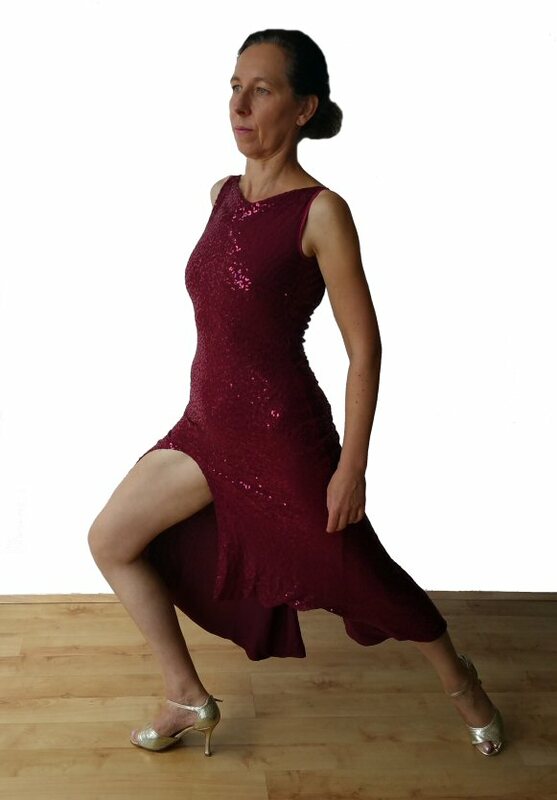 Classic Tango lines with split at the back and another split on the right thigh. Made in stretch crepe, the skirt will adapt to your shape easily. The fabric is easy care: machine washable, dries quickly and does not require ironing. Length on the front 71cm (28"), to the longest place on the back, 85cm (33.5"). The top has a double collar and a knot at the front. Street style Tango skirt with slit at the back and four buttons on the rigth hip. The buttons are for decorative purposes only and do not open or close. Available in UK size 6 - 16. They can also be made to your size. Very practical tunic shorter on one side to wear with leggings. It works great for teachers allowing them to show the knees and legs. Made in stretch crepe, the will adapt to your shape easily. The fabric is very soft in touch making it a pleasure to wear. 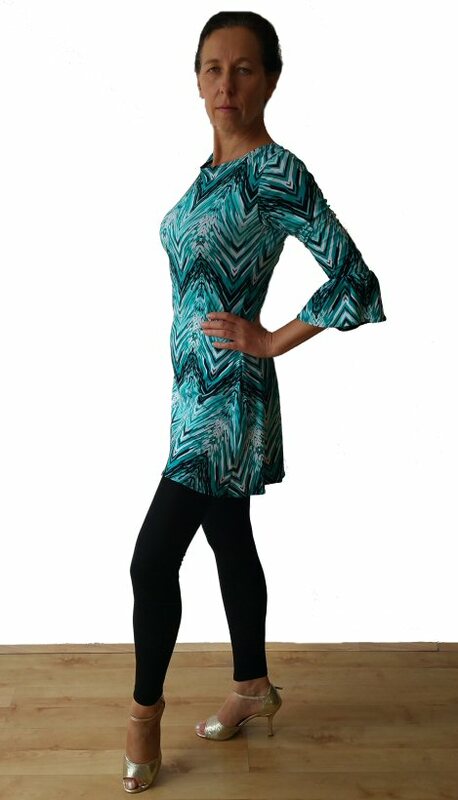 Very practical tunic to wear with leggings or on its own. It works great for teachers allowing them to show the knees and legs. Made in stretch crepe, the will adapt to your shape easily. The fabric is very soft in touch making it a pleasure to wear. Two diagonal frills and a slit on the right thigh. Length: longer side 78cm (31"), Shorter side 62cm (24"). From waist to top of the slit 31cm (12"). Elasticated waist. Good choice for larger sizes. Soft in touch, stretch crepe. This skirt has a lace insert over the right thigh and another one centrally at the back. The back side is slightly longer and ends with a point. Length from 63cm (25") at front to 83cm (33") at the back. Elasticated waist. Available in UK size 8 - 16. It can also be made to your size. Soft in touch, stretch crepe. The skirt has a split on right side covered with beads creating dropping stones effect. The front and back are slightly pointed, there is a short split in the back side. Length from 72cm (28.5") on sides to 80cm (32") at the back. Elasticated waist. Available in UK size 8 - 16. It can also be made to your size. Soft in touch, stretch crepe. This skirt has a lace layer on the back and diagonally cut lace on waist. There is also a split over the right leg and a piece of lace covering it. The back side is very slightly longer and ends with a point. Length from 70cm (27") at front to 76cm (30") at the back. Elasticated waist. Available in UK size 8 - 16. It can also be made to your size. Soft, two way stretch microfibre. The skirt has Lace neck and hem. (matching mens shirt available). Length from shoulder top to hem 98cm (39in). The dress comes with separate black bra cups. Two way stretch soft touch. Silver tape at the neck line. Please note: The hem is finished with black crinoline tape, there is no silver tape at hem (photo needs updating, sorry). Length from shoulder top to hem 98cm (39 inch). The dress comes with separate black bra cups. Soft, two way stretch microfibre. The skirt has a kick-out hem with Black Fringe (matching mens shirt available). The same fringe is used on the dress shoulders. Length from shoulder to hem 98cm (39in). Available in UK sizes 6 - 14. It can also be made to your size.